Yesterday Nadarine tweeted "Octopus chair? NO NO NO" and I just want to say, with all love and due respect, she is wrongy wrong wrong wrong wrong. 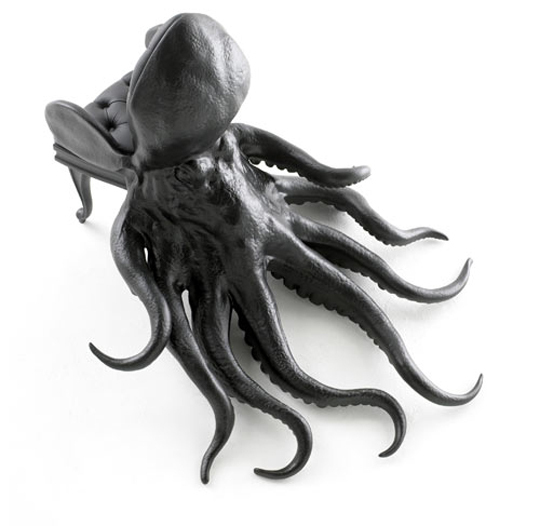 Octopus chair? YES YES YES. It's by Maximo Riera, who according to his website also has made pieces identified as "Rhino," "Lion," "Beetle," "Whale," and "Walrus," but they are tragically hidden behind a gallerists-only passwall. Grar. This extraordinary object is, apparently, a Lalanne hippo (I'm guessing artist Francis Xavier, and not my first thought which was creepy-strong old guy Jack), but the important thing is that it is actually a Transformer that turns not from a truck into a giant robot but from a sculpture of a hippo into a freaking bar. A bar! 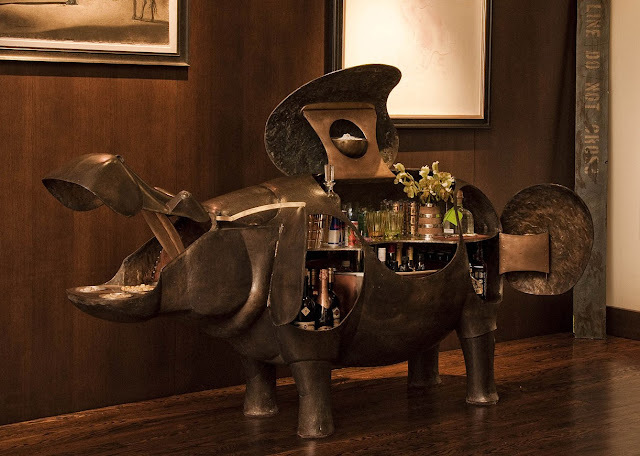 IT IS A HIPPO THAT TRANSFORMS INTO A BAR. The very fact that this exists has renewed my will to live for at least a week. It is owned, mais oui, by socialite-fashion person Lauren Santo Domingo, who is very happy to display it on the well-manicured pages of Vogue.com. "Reality Bites, the movie that in my youth I thought was very funny, and in my current state of adult decrepitude makes me want to scream at people about wearing bras, getting a goddamn job, washing their hair (I’m looking at you, Ethan Hawke), and not being pretentious assheads (ditto). Like, when you start rooting for the Taye Diggs character in Rent, and Ben Stiller in Reality Bites, and you cheer for Janeane Garofalo in that movie when she tries to get Wino a job at The Gap, you know you’re inching outside the target demographic. Although, I like to think of it as wisdom. PAY THE RENT, PEOPLE. Pay for your Snickers. God." This is the other way I know I am getting super old. That I agree with things like this. Alex: Many happy returns Helen! My New Years resolutions this year are mostly aesthetic in nature. Primarily, I want to start doing things with my hair that are more complicated (or at least more interesting) than just "up" and "down." Secondarily, I would like to wear at least one thing a week that I haven't worn before, or haven't worn in a long time. Thirdly, I would like to have the author of my favorite piece of any sort of literary writing ever write something for me over at my new job. Oh wait, that already happened, and it's awesome.